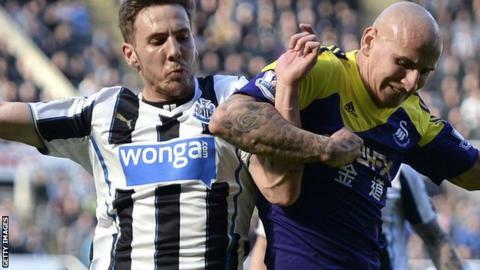 Bournemouth are in talks to sign Newcastle's out-of-contract midfielder Dan Gosling, report BBC Radio Solent. The 24-year-old joined Newcastle on a free transfer in July 2010 but has made just five Premier League starts, with a further 19 appearances from the bench. Gosling's deal with the St James's Park side expires in July. He began his career at Plymouth before joining Everton for £2m in January 2008 and spent part of 2013-2014 on loan at Championship side Blackpool. In March, Gosling was fined £30,000 by the Football Association for breaching betting rules.